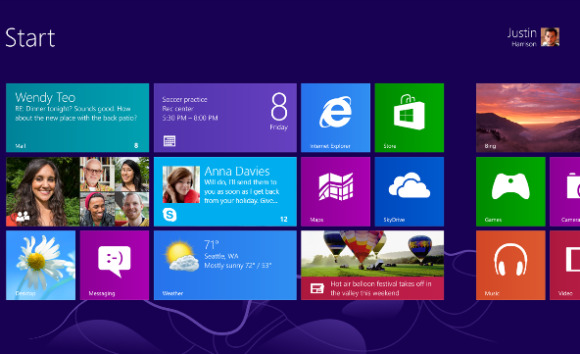 Windows 8 is here, but plenty of Windows users are still on the fence about whether to take it for a spin. In the wake of Windows Vista, you can't blame Windows users for being cautious; upgrading unquestioningly to the latest version of our operating system is a luxury we may have envied in our Mac OS brethren, who can (usually) look forward to the newest big cat without reservation. If you're thinking about upgrading to Windows 8 but you're concerned that you might permanently mess up your PC (or be stuck with an OS you don't like), read on to see whether the new Windows is right for you. For the purposes of this article I decided to use my main desktop PC. It's a home-built system cobbled together mostly from older spare parts, so if anything were likely go wrong with a Windows 8 install, it would probably go wrong with my FrankenPC. The computer packs a decent amount of power--a 3.4GHz AMD Phenom II X4 965 CPU in a DKA790GX Platinum MSI motherboard, 4GB of DDR2 RAM, an Nvidia GTX 570 video card, and a pair of hard drives (a 7200-rpm 1TB drive I use as my main Windows 7 boot/data drive, and an older 5400-rpm 100GB drive I used for my previous Windows XP install). I also have a fair number of associated accessories and gadgets plugged in: two monitors, speakers, a headset, an external mic, a Wi-Fi dongle, a PS/2 keyboard, and a fairly high-end gaming mouse, among other things, so I figured that this would be a good opportunity to see if anything significant broke. Though you can download and run the Windows 8 setup utility simply to upgrade OSs while carrying over your personal data, applications, and settings, I wanted to perform a clean install of Windows 8. This isn't my first time at the OS upgrade rodeo, and I've never had a good experience installing a new OS (Mac or Windows) on anything less than a pristine, freshly formatted drive. If you have the same concerns, I recommend installing Windows 8 on an old PC or on a separate partition of your hard drive. For the purposes of this install diary, I decided to try reformatting my XP drive (which I hadn't booted from since moving up to Windows 7) and then installing Windows 8 on that drive to see whether liked the new OS enough to make the switch permanent. As a PC gamer, I know that even if Windows 8 works perfectly well as an operating system, it may cause games to run poorly (compared to Windows 7, at least) for at least the first six months after its release. 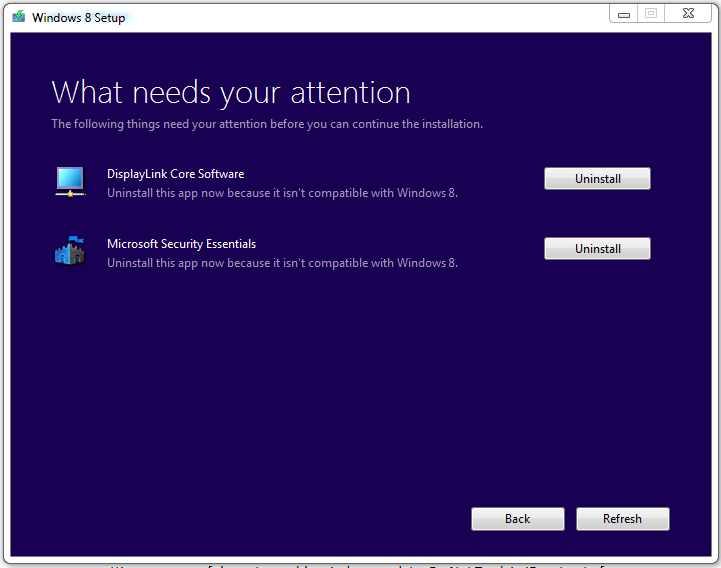 Developers need time to update their software to play nicely with Windows 8. By installing it on my secondary hard drive, I can try it out, see if I like it enough to make it my main OS, and eventually install it on my 1TB boot drive when I'm ready to switch over completely. I started by running the Setup utility from my Windows 8 install DVD, which I made by downloading the Windows 8 64-bit .ISO image and burning it to a disc. If you purchase Windows 8 from Microsoft's website, you can use the old Microsoft Windows 7 USB/DVD download tool to make a bootable Windows 8 flash drive. 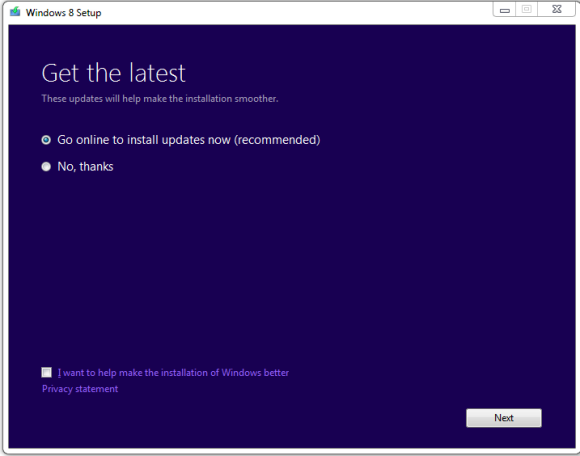 After I popped the disc into my FrankenPC, the setup utility walked me through the basic Windows preparation process, displaying the Windows 8 system requirements and giving me the option to download updates before finishing the install process, which was nice. If you're concerned about enduring a labyrinthine installation process, rest easy: The setup wizard makes installing Windows 8 nice and simple. In my case, though, it was a little too simple; Windows 8 gave me the options of keeping all of the applications and data on my old hard drive, keeping only my personal files, or starting from scratch; but it didn't give me a chance to specify which drive I wanted to install Windows 8 on in the first place! Of course I wanted to install it to my old Windows XP hard drive and not on my Windows 7 drive, but I went ahead and chose the 'Keep everything' option just to see where the setup process would take me. After spending a few minutes scanning my Windows 7 boot drive, Windows 8 Setup determined that I had two programs on my hard drive that weren't compatible with Windows 8 (the DisplayLink Core driver software and Microsoft Security Essentials), and it waited for me to uninstall them. Don't worry about incompatible software, because Windows 8 will (usually) notify you of problematic software before you install the new operating system. Windows 8 isn't the boss of me yet, so it doesn't get to tell me what to do. I knew I had to find a way to change where I was going to install the new OS, but the Windows 8 Setup utility is pretty sparse when it comes to settings or options. Nothing I could do from within the setup utility would allow me to choose the option I wanted (install to a separate drive), so I decided to quit the app altogether and then boot from the Windows 8 install disc itself to see if it would give me the same generous install options previous Windows installers did. Success! Within a few minutes, I was staring at the proper Windows 8 installer. Apparently, running the Windows 8 setup utility from within Windows 7 limits your upgrade options; if you want more control, consider burning the Windows 8 .ISO to a piece of bootable media (a DVD or USB drive) and then booting directly from that. If your BIOS isn't configured to let you try to boot from your optical drive or USB drive before booting from one of your hard drives, you might need to rearrange the boot-load order manually to get this to work; consult our guide on how to enter your BIOS or check your motherboard manufacturer's website for more information. Booting straight from the Windows 8 install disc gave me two options: install Windows 8, or repair my computer. Curious, I chose to repair my computer, hoping that I could format my XP drive from there. Instead, the installer brought me three new options: 'Refresh your PC', 'Reset your PC', and 'Advanced Options'. The first two appeared to be Windows equivalents of a smartphone's different Factory Reset functions [note that refreshing your PC will reinstall Windows 8 while preserving your files and settings, whereas resetting your PC will restore it to factory defaults and overwrite your settings], neither of which I wanted, so I clicked through to Advanced Options and got the option to run diagnostic utilities, return to the command line, and a few other things. Nothing looked hard drive-related, however, so I clicked back to try to return to the Windows 8 installer, only to discover that I would have to shut down and reboot from the install disc again to do so. This was mildly irritating because I knew it would take the boot disc a few minutes to boot into the Windows 8 installer. The fastest, simplest Windows installation process yet. Once I got back into the installer, I clicked through until I reached the two familiar Windows install options: 'Upgrade' (which can keep your files intact), and 'Custom Install'. Choosing the custom install option let me reformat my 100GB drive and start the installation process. Luckily, the actual installation didn't take terribly long; I clicked the button at 5:59 p.m., the first install loop rebooted my PC at 6:06, and the new installation setup process was all ready to go by 6:10. Had I obtained the install options I wanted from the very beginning, I could probably have switched to Windows 8 in half the time. Once I booted into Windows 8, the rest of the process was painless. An 'Express Settings' option automatically enables Windows Update, enables Do Not Track in IE, and opts out of a bunch of Microsoft's analytics and reporting systems. From there, I spent the rest of the day going through my usual new-Windows routine (batch-installing apps with Ninite, grabbing device drivers, and so on) and messing around with the new Start Menu. The new Windows 8 Start screen works sort of like a full-screen Start button. 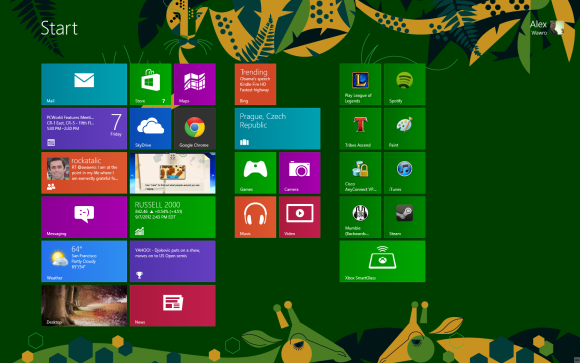 Here's a quick tip: On a desktop PC you can navigate between Windows 8 Start screen tiles with your arrow keys, and select an app by pressing Enter—so if you want to get to the Windows 8 desktop as quickly as possible, simply relocate your Desktop tile to the primary position (top left) of your Start screen. That way you can switch over to your desktop by pressing the Enter key when the Start screen appears. It wasn't immediately obvious to me how to shut my PC down when I was finished with it; in Windows 7 I usually just select 'Shut Down' from the Start Menu, but in Windows 8 I had to click my user name, log out, and then shut down from the login screen. Eventually I figured out that I could shut down my PC more quickly by pulling up the Charms menu and selecting 'Power' in the Settings menu, but I didn't realize that initially. 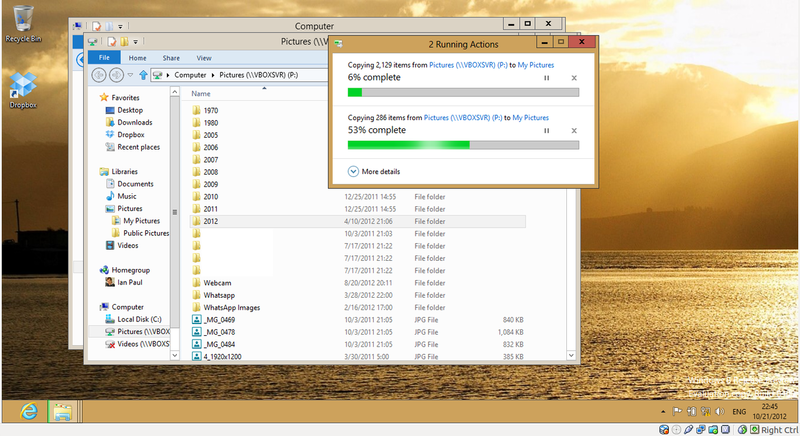 If you have the same issue, consult our column on how to shut down Windows 8 for more information and screenshots. Small but significant improvements (like being able to move multiple files simultaneously) make Windows 8 worth upgrading to. 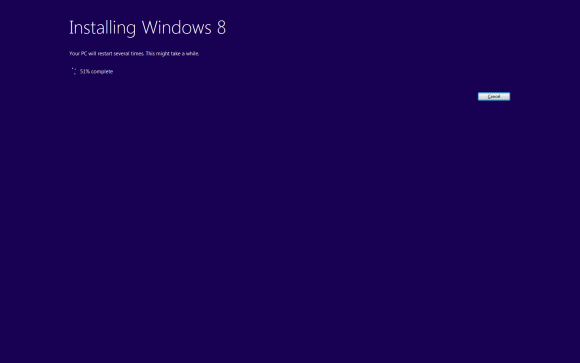 The Windows 8 installation process seems to be more streamlined than any previous version of Windows, which can be a pain for advanced users. For better or worse, though, under that candy-colored Windows 8 interface and slick new logo lies the same idiosyncratic Windows we know and love. Once you get Windows 8 installed and configured the way you want it, using it for daily work feels remarkably similar to using Windows 7. You still move and copy files in Windows Explorer, drag windows on your desktop, and right-click to bring up context menus. The only difference is that your Start button is gone, and running your mouse cursor along the edges of the screen triggers a few extra tools like the Charm bar and the app switcher. You can master or ignore these new tools—like the new Windows 8 Start screen—as you prefer; at its heart, Windows 8 is still Windows.